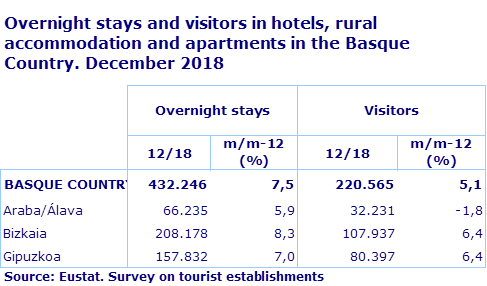 Overnight stays registered in tourist apartments in the Basque Country in December 2018 stood at 22,393, up 31.8% on those registered in December 2017, according to EUSTAT data. There was a year-on-year positive trend in overnight stays in the three provinces: in Gipuzkoa they increased by 42.9%, in Bizkaia they grew by 36.2% and in Álava they were up by 18.7%. Furthermore, there were 5,233 visitors registered in tourist apartments in the Basque Country in December 2018, which was a rise of 4.5%. By province, the number of visitors was down 28.1% in Gipuzkoa and 8.7% in Álava, but was up 37.1% in Bizkaia. This December the average length of stay was 4.28 days, above the average length of stay of 3.39 days registered in December 2017. In Álava there was an increase from 6.04 days last year to 7.86 days in December of this year; in Gipuzkoa, there was also a rise from 2.48 days in December 2017 to 4.93 days this December, however, in Bizkaia the average length of stay fell from 2.94 days in December 2017 to 2.92 days in December 2018. In 2018 there were a total of 308,409 overnight stays in tourist apartments in the Basque Country, which was a rise of 26.6% compared to 2017. Overnight stays increased in the three provinces: in Gipuzkoa by 50.7%, in Álava by 32.9% and in Bizkaia by 7.5%. There were 79,306 visitors registered in tourist apartments in the Basque Country in 2018, up 8.3% on those registered in 2017. Visitor numbers were up by 24.2% in Álava and 16.3% in Gipuzkoa, but down by 0.7% in Bizkaia. The average length of stay in 2018 was 3.89 days, an improvement on the 3.33 days in 2017. 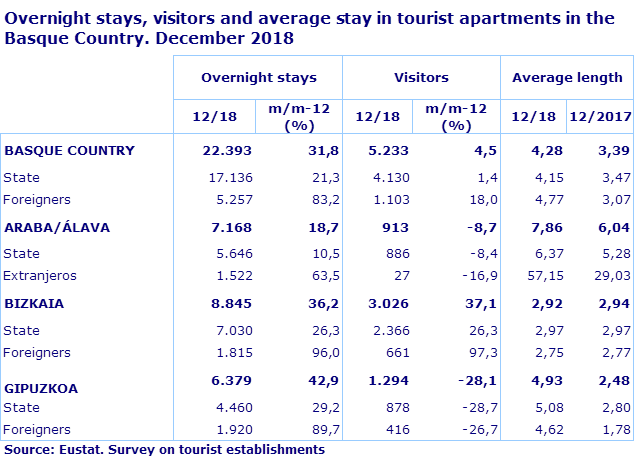 In Álava the average length of stay rose from 6.46 days in 2017 to 6.91 days in 2018; in Bizkaia it increased from 2.78 days in 2017 to 3.01 days in 2018 and in Gipuzkoa the average length of stay in 2018 was 3.73 days, a clear improvement on the 2.88 days obtained in 2017. In hotels, rural accommodation and apartments as a whole, there were 220,565 visitors in December 2018, which was an increase of 5.1% on the same month of the previous year. 48.9% of the total number of visitors to the Basque Country was concentrated in Bizkaia, and total visitor numbers rose by 6.4%. In Gipuzkoa, which accumulated 36.5% of visitors to the Basque Country, there was an increase of 6.4% and in Álava, with 14.6% of visitors, there was a fall of 1.8%. Overnight stays in the total number of tourist establishments were up by 7.5%, with increases in all three provinces: 8.3% in Bizkaia ,7.0% in Gipuzkoa and 5.9% in Álava. 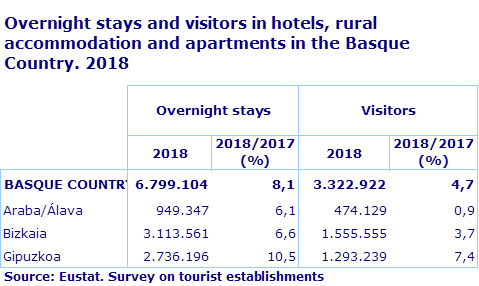 During 2018 there were a total of 6,799,104 overnight stays in the Basque Country in hotels, rural accommodation and tourist apartments, up 8.1% on those registered in 2017. Overnight stays also rose in the three provinces: by 10.5% in Gipuzkoa, 6.6% in Bizkaia and 6.1% in Álava. There were 3,322,922 visitors registered in hotels, rural accommodation and tourist apartments in 2018, an increase of 4.7% compared to the previous year. Visitor numbers also improved in the three provinces: by 7.4% in Gipuzkoa, 3.7% in Bizkaia and 0.9% in Álava.